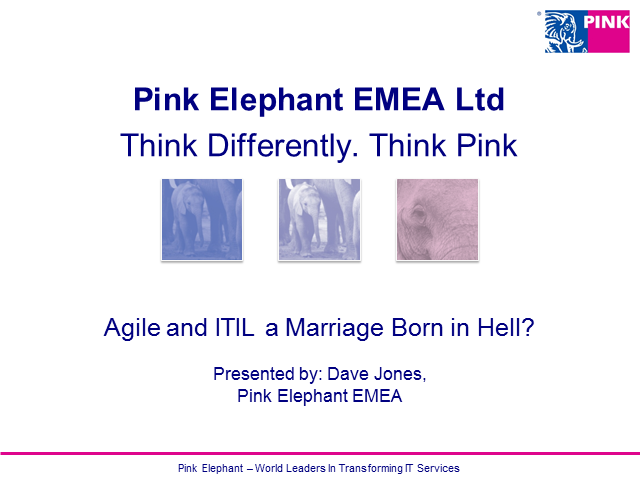 Agile and ITIL a Marriage Born in Hell? The recent (well within last few years) usage of Agile project management approach to deliver business driven requirements faster has presented a few issues to IT Service Management and in particular the integration with ITIL processes. Agile practitioners say of their methodology that it is lean, adaptive, delivering fast and relevant results for the customer through rapid development. In direct contrast, the ITIL practitioner will seek security, availability and stability of a Service through the control and management of change and risk to the live (production) environment. This webinar looks to introduce some of the issues and perhaps suggest some ways to overcome them. Title: Agile and ITIL a Marriage Born in Hell?